Stephen and I are so proud of you! We can not wait to read your book. We have been telling all our family and friends!!!! I can not wait to meet you and Stephen can not wait to see you again. Thank you, Marissa. What do you think of the posted messages so far? Keep checking this site. Every few days another message will appear, frequently they will be brief excerpts from the book. Thank you, Donna, for your kind thoughts. This is an important message at a critical time. Society and church alike need to be awakened from slumber. I personally can’t wait for the book release and I will recommend it to every pastor I know! Thank you for your kind thoughts. The situation in our culture and families demands urgent attention. Hopefully, a vibrant blog discussion will begin provoking action in advance of the book. What do you think? Stay tuned and enjoy the discussion. About three blog posts will appear each week. Look forward to reading the book. I remember reading a small excerpt during one our classes and it was quite insightful, so I’m sure it’ll be great. Best wishes!!! Thank you, Jillian. It’s an exciting process. Best of luck to you on your book, Mr. Stebbins. I’ve enjoyed what I’ve read so far. Keep up the good work, and I look forward to reading future posts. Thank you, Lauren. I greatly appreciate the encouragement. Stay tuned! A lot of other great blogs are coming up–about 2-3 per week. Lloyd, the blogs you post are indicative of the enormous amount of study you are sharing. The book must be packed with hard- earned facts and formulations, far beyond what we presently are gleaning from such fascinating truths. Thanks, Pris. Keep checking back. You’ll see things here that you’re unlikely to find anywhere else. Thank you for providing us the opportunity to read the brave, thought provoking and given the current cultural climate, at times unsettling wisdom of the leaders that founded this great experiment in democracy. I look forward to the publication of your book. Gary–Thank you for the encouragement. Keep following this blog. There will be new material added two to three times each week. Wishing you best of luck with your book. I am enjoying your blogs and facebook posts. Thank you, Suzzie. I’d be thrilled if you’d look at the other blog messages and add your thoughts. Thank you for spending time speaking with me Dr. Stebbins. I did read your blog posts about the homemaker and particularly, about the gap in the resume perspective. I felt like both posts could have been written about me…and like many other women “my age” who felt like she needed to have it “all”…except all was defined by somebody else but then got trapped into that fallacy. I can’t wait for your book to be published, as I’m sure I will thoroughly enjoy reading it in it’s entirety. You are one of millions duped by the feminist movement. The book distinguishes between feminism and radical feminism. Feminism is the desire for equal work opportunities at equal pay. No problem there. However, radical feminism is an aggressive political movement determined to destroy family, religion, the Constitution, free enterprise, and democracy if favor of humanistic socialism, which is just one step toward tyranny. What do you think? Define radical feminism? There is no movement by any womens organization to take the “man” out of the “cat bird seat”. Men themselves are not earning it theses days. They are enrolling in college less, not working as hard, and producing children but not being responsible fathers. Leaving women to be strong enough to do it all. Good question. Feminism is simply a social/cultural desire for women to have equal job and career opportunities at equal pay. No problem there. However, radical feminism is a political movement with the aim of replacing democracy (representative republic) with socialism. To do so, the movement must destroy the free enterprise system, capitalism, the Constitution, the traditional family, and religion. The movement involved rewriting history to focus on America’s flaws rather than America’s successes, hyping the villains and vilifying the heroes. Radical feminism does not recognize any of the wonderful inherent differences between men and women except the personal plumbing. The late Judge Robert Bork recognized radical feminism as, “the most destructive and fanatical movement to come down to us from the Sixties. This is a revolutionary, not a reformist, movement…Totalitarian in spirit, it is deeply antagonistic to traditional Western culture and proposes the complete restructuring of society, morality, and human nature. Radical feminism is today’s female counterpart of Sixties radicalism.” What do you think? Love you blog posts Dad. I am beyond proud of you. It’s truly amazing how God is using you. I love you and can’t wait for your book! Thank you, Traci, for your love and encouragement. GREAT INSIGHT ON THE BOOK, THERE SO MUCH GOING ON PPL NEED TO WAKE UP PROUD OF YOU! It’s a joy to sit with you and I early-morning men’s prayer breakfasts. How exciting to know that God is moved you to write about Joy, since so few believers have much joy on a daily basis. As my wife and I fly for a mission in Africa today, it’s my prayer that God will open every door, so that your book will be published very soon. Thank you, Charles. I appreciate your kind thoughts and prayers. May the Lord be with you on the Africa Mission. Thanks for having the courage to take a firm stand on these critical issues. The “politically correct” crowd strives to silence all views contrary to their own. Sadly, logic often escapes them. I appreciate your vote of confidence, Doug. “Political correctness” is an attempt to shut down logical discourse and replace it with unsupported emotion. The politically correct crowd to which you refer thrive on intimidating anyone opposing their views. It’s way past time for thoughtful people to stand up for their convictions, which nearly always have spiritual roots. What do you think? Ultimately I think that all thought and expressions of the same have spiritual roots, even though the secular culture doesn’t recognize that. While labels can be misleading, my perspective comes from an orthodox, conservative, Christian worldview. I hold the Bible to be inspired, inerrant, and infallible. It is my trusted source for what Francis Schaeffer called “true truth”. Doug, I share your views. I have spoken to many groups and find that if you ask an atheist/agnostic the source of his/her values, the reply is usually, “I learned my values from parents, friends, teachers” etc. Pressing the issue, ask where did your parents, friends, and teachers get their values? The atheist/agnostic will reach back another generation. Continue pressing and you’ll discover that the values commonly held by them ultimately have spiritual roots if you go back far enough. Outside of Biblical values, there is no basis for determining right from wrong. Everything becomes relative eventually sanctioning all manner of evil. The evil is simply covered by a host of sugary names, the most current of which is “tolerance.” What do you think? 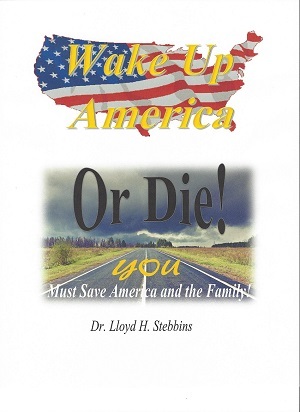 Dr. Lloyd Stebbins is truly one of the most enlightened and intellectual men I’ve ever met. He was my professor for 3 chemistry courses and I can tell that his experience as a teacher and in his field has made him a well-rounded and professional man. Dr. Stebbins regularly shared excerpts from his book to me and I left each meeting with a new and inspired outlook on what life means and how to treat it. I love how Dr. Stebbins is a true believer and follower of Jesus and his beliefs are well thought out and presented very well to convey the overall mission of the body of Christ and that is to spread love and slow down enough to realize how important life is around us. Dr. Stebbins always held true to his faith and is earnestly concerned with the world and its leadership. Prepare yourselves for an enlightened perspective on life and how economics, health care, politics, health, human life, and the integration of God throughout all of his writings. Thank you so very much for your very kind thoughts and encouragement. Lloyd – you are a gifted writer with the ability to put into words what we have in thought. I am sending this article to my email list of friends. It is fantastic! Thank you! Thank you! Who knows. Perhaps your encouragement will help capture the attention of a publisher. Lloyd, there is not a better time than to approach the wisdom I’m sure is in this book. These are the critical end times, and if we don’t act – it would be a sin of omission. Thank you for your contribution with this book. Thank you, Tad. The book is exciting. Many people are waiting for it to be published. For now, I have a signed contract with a literary agent. He is pitching the book to various publishers. I appreciate your encouragement. try hooking it up to another computer to remove your personal data to another drive temporarily while your computer is in for repair. Thank you, Mary Ann, for the encouragement. Please pray for the Lord to raise up a publisher for the book. It has attracted 24 strong endorsements, including 14 from people who are nationally or internationally known. Please pray for a particularly prominent endorser who is currently considering the book. In addition, one of the internationally known endorsers invited me to co-author a book with her. That book is complete; please pray for a publisher. Enjoy an awesome and blessed day! I could be wrong, but I feel most publishers today are looking for a fluffy message.. Have you tried Front Line, Charisma House? They published The Harbinger.. charismahouse.com. I will be praying that God will open a door that no man can shut! Thanks, Mary Ann, for the wise counsel. There’s a lot of “fluffy message” books out there. But is seems a bit like Nero’s fiddling while Rome burns. The body of believers desperately needs some tough love, expressed in an entertaining and readable way. I haven’t tried Front Line, Charisma House. It’s interesting, because they’re located in St. Marys, Florida only about an hour from where I live. Sounds like a great idea. Also, my book is just over 400 pages. I’ve been informed by people in the book field that publishers like books about 200 pages, because they can price them in a range more likely to sell. Accordingly, I’ve recently split my book into two shorter books. The eventual publisher can then choose the full or separated versions.